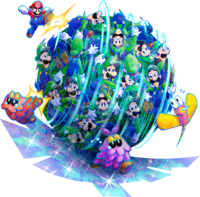 A Luiginoid is a species appearing in the Dream World in the game Mario & Luigi: Dream Team; they are exact duplicates of Dreamy Luigi. Luiginoids can be activated with Dreamy Luigi when the player is near a Luiginoid Formation. They can be transformed into three forms: the Luiginary Stack (which can activate the moves Jump, Lean Over, Ground Pound, Crouch, and Spring Jump), the Luiginary Typhoon (which can activate the moves Spin Jump, Hover Spin, and Tornado), and the Luiginary Ball (which can activate the moves Ball Hammer and Hookshot). Each form is learned at various intervals in the game. They are also present when doing Luiginary Attacks, where they are the main attacking force. Also, it seems that when Dreamy Luigi is in a crisis, many Luiginoids "fuse" with him in order to make him giant. Various Luiginoids appear on Luigi's extra Battle Card in Mario & Luigi: Paper Jam. This page was last edited on October 30, 2018, at 12:03.